"You have not shown any trace of respect for the rights of minority religions to operate with a religiously unbiased court system. And that is the root of this discussion. All else is distraction." Excerpt from a posting to a Beliefnet discussion board, 2003-AUG-25. "Let's get one thing straight, this is about acknowledging God." Chief Justice Roy Moore. Governments cannot promote one religion over another. Governments cannot promote a religious lifestyle over a secular lifestyle. Governments cannot promote a secular lifestyle over a religious lifestyle. Placing the Ten Commandments in a public school room or in the rotunda of a Justice Building would violate the first two of the above criteria: It would promote Judaism and Christianity over other religions. (Recall that almost half of the Ten Commandments refer to the necessity of worshiping Yahweh alone.) Its presence in a government building would also promote a religious lifestyle over a secular lifestyle. It would also give the impression that the courts are Judeo-Christian institutions. Non-Judeo-Christians might well be concerned about the possibility of them receiving justices at the hands of such courts. However, the exhibition of the Decalogue would be constitutional if it appears as one element in a cultural display -- a grouping of religious and secular legal documents. In most cases, court rulings are respected and implemented quickly. 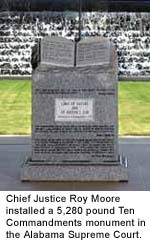 However, after Chief Justice Roy Moore he was ordered to remove the granite monument containing the Decalogue in the Justice Building in Mongomery, AL, he refused to comply. Why does the U.S. Constitution require separation of church and state? Briefly, when the Constitution was written, its authors were well aware of the evils and massive loss of human life that had been experienced in Europe in prior centuries because of inter- and intra-religious conflict. They reasoned that the best way to avoid importing religiously-based hatred, oppression, mass murder and genocide into the New World was to separate church and state, religion and government, into two separate entities with a minimum of interaction. The U.S. is certainly the most religious large country in the developed West. Christianity has largely failed in Canada, Australia, New Zealand, and Europe, as measured by public belief and church attendance. America has avoided the type of massive disruptions and loss of life experienced in recent decades during religious conflicts in Northern Ireland, Bosnia, Kosovo, Macedonia, Cyprus, Nigeria, Sudan, Middle East, Iraq/Iran, Afghanistan, India, Sri Lanka, Philippines, etc. The U.S. is generally regarded as the most religiously diverse country in the world. The percentage of individuals who identify themselves as Christians is dropping by almost one percentage point per year. Some feel that the separation of church and state is the best policy to minimize future inter-religious conflicts as the country becomes even more secular and religiously diverse. America was founded as a Christian state by Christian politicians. A substantial majority, about 75%, of its citizens are Christians. Christian theological and moral beliefs, shared by most of its citizens, adds great stability to the nation. We should acknowledge the country's Christian heritage by having students recite prayer in schools, displaying the Ten Commandments, opening sessions of municipal, state and federal governments with Christian prayers, including "Under God" in the Pledge of Allegiance, including "In God We Trust" as the National Motto, etc. What are Chief Justice Moore's legal arguments? The First Amendment of the U.S. Constitution does not apply to the actions of state officials. This was initially true. The First Amendment was originally written to limit only the powers of Congress. In fact the Establishment Clause of the First Amendment starts: "Congress shall make no law...." However the U.S. Supreme Court has traditionally interpreted the Amendment as also applying to "other branches of government and government officials." 2 The Supreme Court has held for many decades that the Due Process Clause of the Fourteenth Amendment to the Constitution, which was passed after the Civil War, widens the application of the First Amendment to include all state and local governments. The courts have also established that the Ten Commandments can legally form part of a cultural display if it is combined with documents and artifacts from a variety of religions and from secular sources. But it seems to have been the intent of Chief Justice Moore to display the monument in isolation, perhaps implying that it is the sole origin of America's laws. While Chief Justice Moore's arguments may gain a great deal of support among fellow Southerners who might wish that they are valid, it is extremely unlikely that any would be accepted by an American court today. Those who feel that the government, including its schools and courts, should acknowledge in concrete ways that America was founded by Christians on Christian principles, and that it remains a Christian country. Those who feel that the principle of Separation of Church and State is an important component of the U.S. Constitution and is our greatest hope for future religious peace in the country. Those who celebrate the religious freedom and religious diversity of the United States -- the ability of each citizen to follow the religion of their choice. Those who feel an obligation to obey the laws of the land, even if this is in conflict with their need to grant public recognition to their God and their God's laws. Exactly what principles are involved in the conflict? It is not about preventing the public from freely viewing the The Commandments. There are literally thousands of locations in Montgomery where the monument could be legally installed for all to see: on church grounds, commercial land, private parks, etc. It is not about preventing the monument from being located in the Justice Building. Judge Thompson of the 11th Circuit Court of Appeals has allowed it to be relocated from the rotunda to a different location in the building. Whether the monument can be located specifically in the rotunda of the Justice Building, the main focal point of the structure. Whether the law of the land should command greater allegiance from its citizens than their belief in publicly recognizing the supremacy of Yahweh. What does the Bible say about obeying governments and courts? Proverbs 28:12: "Those who forsake the law praise the wicked, but those who keep the law resist them." Romans 13:1-4: "Let every soul be subject unto the higher powers. For there is no power but of God: the powers that be are ordained of God. Whosoever therefore resisteth the power, resisteth the ordinance of God: and they that resist shall receive to themselves damnation. For rulers are not a terror to good works, but to the evil. Wilt thou then not be afraid of the power? do that which is good, and thou shalt have praise of the same: For he is the minister of God to thee for good...."
1 Peter 2:13-14: "Submit yourselves to every ordinance of man for the Lord's sake: whether it be to the king, as supreme; Or unto governors, as unto them that are sent by him for the punishment of evildoers, and for the praise of them that do well." Titus 3:1: "Put them in mind to be subject to principalities and powers, to obey magistrates, to be ready to every good work..."
On another note, Exodus 20:4 states: "Thou shalt not make unto thee any graven image, or any likeness of any thing that is in heaven above, or that is in the earth beneath, or that is in the water under the earth." This is the first of the Ten Commandments, according to Roman Catholic church and some Lutheran denominations. It is the second Commandment according to other Christian denominations and Jews. A good case can be made that the monument installed by Chief Justice Moore can be considered a religious "graven image." It is a likeness of the Bible -- a "thing" that is on the earth. It is ironic that the creation of a monument to the Ten Commandments may be considered forbidden by one of the Ten Commandments.